It's time for me to stop making excuses for not posting a creative post - after all this is supposed to be a creative blog. Excuses include things like not knowing how to insert to my liking, not knowing how to Photoshop to my liking, not having a picture to my liking, not taking a before picture (which is not to my liking) etc. etc etc. I'm not even sure that I know how to correctly source the picture I just inserted from another blog. However, it will now be my theme song for 2012. When I saw this quote today, I decided it was time to stop making excuses and JUMP. By the way I got this quote from the Growing Your Blog series that some of my favorite bloggers are doing this week - and I think if you click HERE you can reach that very site. If this works then I have erased excuse #1. I'm kind of smiling right now at the thought of accomplishing that little link :)! I made the coolest dresser for my son and his girlfriend - to give him for Christmas. 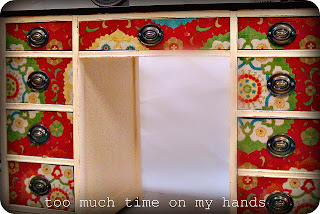 Because I was in a big hurry, I did not take a before picture so you must use your imagination - remember this is a creative blog so the creative process begins here. Imagine a white, 5-drawer dresser, made from what must have been the highest quality of laminated particle board. I say this because it was VERY VERY hard to get the paint to stick. I've been painting furniture for about 30 years and I don't think that I have ever had so many problems getting paint to stick and stay on a piece. The piece was inspired by a fabulous desk I found by Kim @Too Much Time On My Hands. It is just exceptional. She also did a great tutorial - which I followed for the decoupaging process. Wow! Inspiring huh? 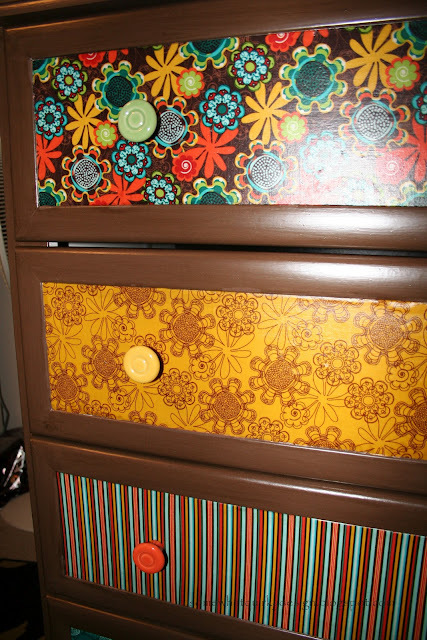 I've done a lot of furniture decoupage, but never with fabric. I decided that this would be a good time to start. 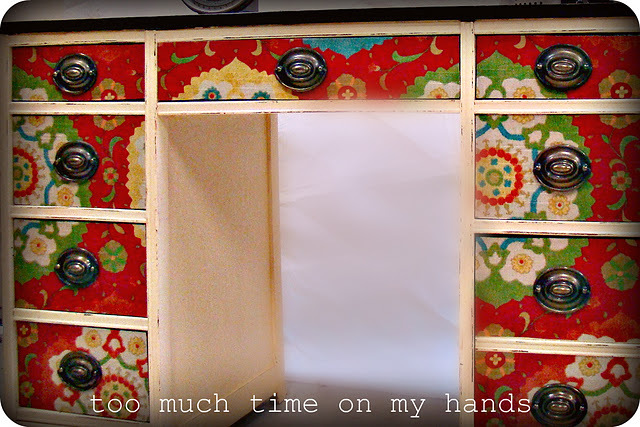 First I had to paint the white dresser that you have imagined. The iPrime is a high adhesion primer tinted grey which I have used successfully on shiny surfaces many times - even without the deglosser. I started with just deglosser then primer. Woops. The paint just shriveled up as if I was painting on glass. So I wiped it down and sanded all surfaces - not my favorite thing to do. The primer stuck, but it was still a very delicate finish - easy to scratch. Then I painted the whole thing with Sherman Williams Arapaho Acres (197-5) in Satin - a milk chocolate brown from my paint stock. I bought this paint in 2006 and have used it on many different projects since. Then I swiped on Old Masters Gel Stain in Dark Walnut in somewhat of a wood grain/linen type pattern. This darkens it nicely and gives a nice depth to the color. 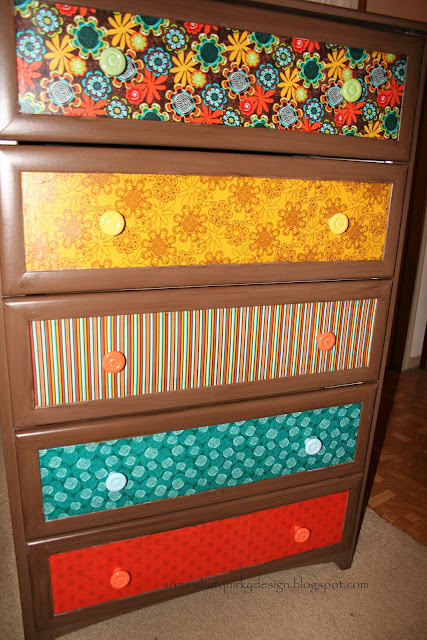 For the fabric I used a package of fat-quarters I found at JoAnn's - one pattern for each drawer, perfectly coordinated courtesy of JoAnn's fat-quarter makers. 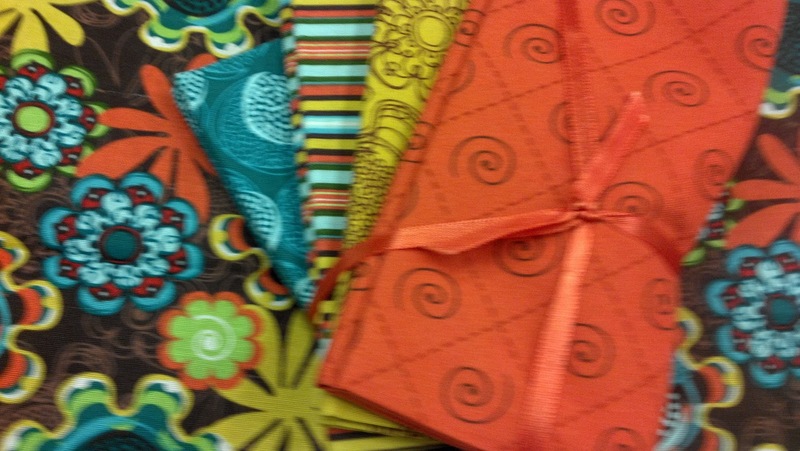 These fabrics are not actually blurry, I just can't hold my phone steady. I cut the fabric to a generous fit and then prepared it with decoupage medium just as Kim did in her tutorial. I applied it to the center of each drawer and trimmed to fit after it was dry. Then I applied at least 6 coats of my long time BEST PRODUCT - Deft Clear Wood Finish Brushing Lacquer -Satin. I love this stuff. It is inexpensive, dries very quickly, and makes a wonderful finish. The big drawback is that it smells really bad. And when I say really bad I mean REALLY BAD. So if you don't have an area outside the home where you paint and finish you must be prepared for this. Windows must be opened no matter the temperature. If it is above 60 degrees outside I recommend doing this outdoors. I felt like several coats were necessary because I wanted a heavy finish over the paint - which was still not "tight" enough for my liking. The original white glass knobs were actually really nice, but they just didn't look good so I replaced them with some I purchased at Hobby Lobby. Finally, I let it harden (and air out) for several days, then wrapped in a big blanket and crammed it, along with another dresser and all of our traveling paraphernalia into our Durango, and hauled it 1100 miles to Oklahoma. We got it there with only slight damage - which is almost not visible. Now finally you can stop using your imagination and see the darned thing.... completely untouched photos (remember, no excuses..). I truly wish I had gotten some good pics without the glare from the flash - just because the dresser is SO FREAKING COOL - and I wanted it to look just as good as it does in real life. Isn't it wonderful? Isn't that yellow fabric to die for? They loved it - which made the whole experience even more fun. So here it is - a post with links and pictures inserted. The links are not working quite like those I see on other blogs - maybe someone has tips for me to experiment with. Now I've got to go work on my basement - which you will hear about later, whether you want to or not! Goal for next time - find a way to not use the word "I" so much. As my dad says "Have a day." Ha Ha, Have a day...I like it. You did such an awesome job! 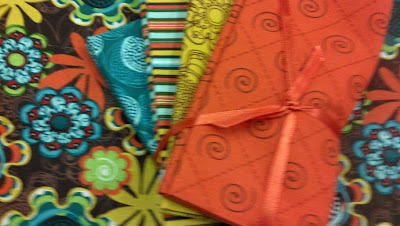 The fabric is great, so fun and great colors. The links are working just fine for me, but it would be nice if they automatically opened a new tab so I didn't lose your page. But guess what? I don't know how to do that! It is probably terrible easy and maybe I need to go research it now too! If you find a way to not use the word I so much, let me know. I haven't figured it out, yet and I'm not sure it's possible when you're writing about yourself. This is so creative-I'm following you from miss mustard seed-stop by for a visit!